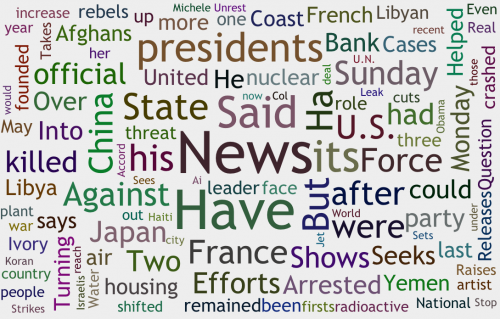 HTML5 Word Clouds is a HTML5 technical demo that generate a Java-based Wordle-like word cloud. For Mobile Safari and IE9 that doesn’t support Web Workers, I wrote Simulated Worker that put the worker script into an iframe scope (instead worker scope). You are welcome to play around, grab the source code and run the testcases to see their capabilities. This entry was posted in My Scripts, Programming. Bookmark the permalink. Share the short link. Sorry but,as fun as this seems in theory….I switched from IE to Chrome just to do this,and,it did not work.And,I have a core i-7 machine,that is just 2 months old. I’ll just make a collage from newspaper and magazine fonts,if I want a pretty graphic of what I am about. I agree with previous comments: the next natural step to take with this would definitely be a filter for the most common words in the language. There is now a new version of WordFreq library available for you to do that — http://http://timdream.org/wordfreq/ Free feel to look up the API and give it a try.